In the last few months I purchased a new wireless headset and wireless computer mouse. As usual I did a lot of research online and in the stores before making my purchases. It was interesting that I purchased both pieces of computer equipment from the same manufacture – Logitech. I now realize that when it comes to computer accessories, I'm very loyal to Logitech. My last few headsets have been Logitech headsets, so I naturally looked at them. But I also looked at other brands to get a good idea of what features are available and the different prices. I also talked to a few friends to see what they were using. Always nice to get a recommendation. My previous headset was connected to my computer using a USB cable. No batteries which was nice, but no mobility. I decided to get a wireless headset this time so I could move around my office when on calls. Before there were times when a document or book I needed in a call was just out of reach and a wireless headset would fix this. I was looking for a headphones for listening to podcasts and making calls on Skype. I was not looking for a gaming headset. My second to last headset had a mute button on it which was handy during calls to mute and unmute myself. I usually take notes during calls and using Evernote and the keyboard can get a little noisy. A few years ago I purchased a cheap small headset for traveling. I thought this would be great for taking Skype calls in hotel rooms. The problem with a cheap headset is that it really hurt my ears and there is no way I could listen to a call for more than a few minutes. After reviewing a few different brands of headphones I focused on the Logitech ones. As mentioned earlier, I had a Logitech headsets over the years and I really liked them. They worked well and I never had any problems with them. One particular set I used while doing a lot of traveling and they took a beating. I did an audio checked with a colleague that is looking to purchase a wireless headphones and he said I sounded great. He's in Brazil and we were talking over Skype. When I first purchased the headset I did some testing to see if it would last 6 hours as they claimed. And yes, it did last six hours. At the five hour mark an LED on the headset starts to flash yellow. The headset lasted another hour before I needed to charge it. The USB cable is for charging only. It doesn't work like a wired headset. 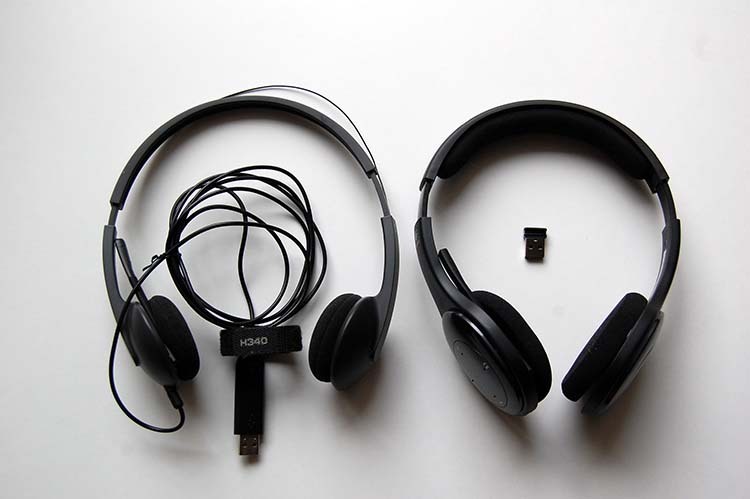 If you are charging and using the headset you need two USB ports if you are using the supplied Logitech USB dongle. Nice if the range of the supplied wireless dongle was greater. No problem in my and just outside my office, but I'm not going upstairs to kitchen while wearing it. 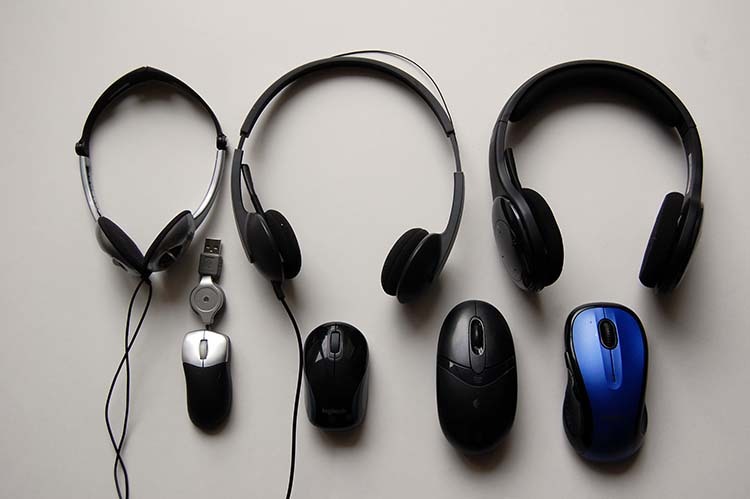 For more information on the Logitech headsets products, please check out Logitech headsets. My last wireless computer mouse was made by Logitech. It was a great mouse and I used it for a few years before getting a new one. It took two double AA batteries and they lasted about 4 to 6 months. I thought this was pretty good. I've used a wireless mouse that had a charger, but I had to remember to put it in the cradle when I wasn't using it to charge it and this was another piece of equipment on my desk. So I decided against this style of wireless mouse. For purchasing a mouse I think it is best to visit a store and check them out. This gives you a good idea of how they feel in your hand. You can also look at any additional features. A lot of mice come with multiple buttons and scroll wheels. So good to test them out and see if they work for you. Last year I purchased a wireless mouse for my laptop and to easily fit in my laptop bag. I really liked having a mouse when working at coffee shops or remote locations. The mouse pad on a laptop is okay for a little while, but I find it a pain to use after a few minutes. My previous laptop mouse had a cord that would retract into a small container in the middle. This was very handy for traveling, but I really wanted a wireless computer mouse. I purchased the Logitech M187 and have been using it for about 6 months. It's a great little mouse that easily fits into my laptop bag. There were a couple of features I didn't initially think about that I really like on this mouse. It has an on/off switch, which will help save the battery. The Logitech wireless USB dongle can be stored inside the mouse under the battery cover. The dongle is small and I was worried about losing it, but now I won't lose it in my laptop bag. My last computer mouse was the first wireless mouse I owned and it was great. No more dragging the cable around my desktop and getting caught on things. After a few years of use I found that dragging emails to different folders wasn't working properly. It would drag them to the wrong folder. Which made them difficult to find and very annoying. At first I thought it was something with the computer or the batteries were low. In the end it was the mouse and I needed a new one. For purchasing the wireless desktop mouse I did the same thing research for purchasing the portable mouse, I went to a store and checked them all out. The old style computer mice had a scroll wheel and two buttons on top. The new wireless computer mice have a lot more options and buttons. Good to do some research here and see what options, buttons and features you need. For me a basic mouse is fine. In the end I purchased the Logitech M510 mouse. It had all the features I needed and it fit well in my hand. 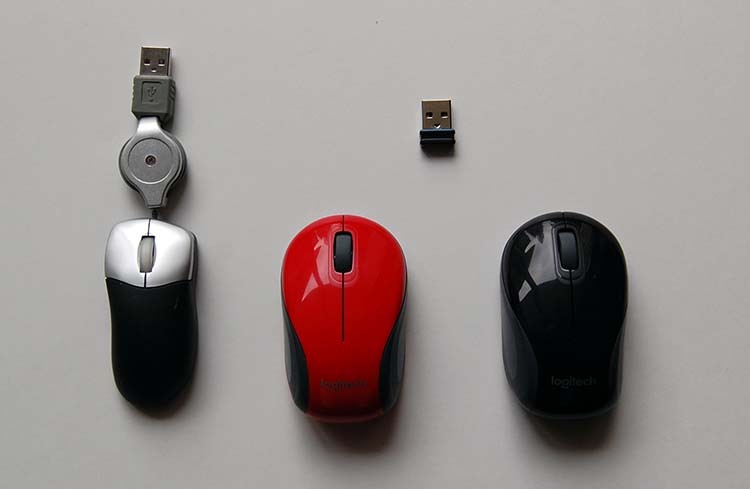 The M510 wireless computer mouse is the mouse on the right in the picture below. After using the M510 I convince my wife to purchase a Logitech Mouse and she purchased the M525. It has all the features of the M510, but it is a bit smaller. It is the mouse in the middle in the picture below. Comparing my old USB connected mouse to the Logitech M525 and Logitech M510 mice. The Logitech M510 is a great mouse and works as expected. It fits well in my hand and I can't think of any cons. 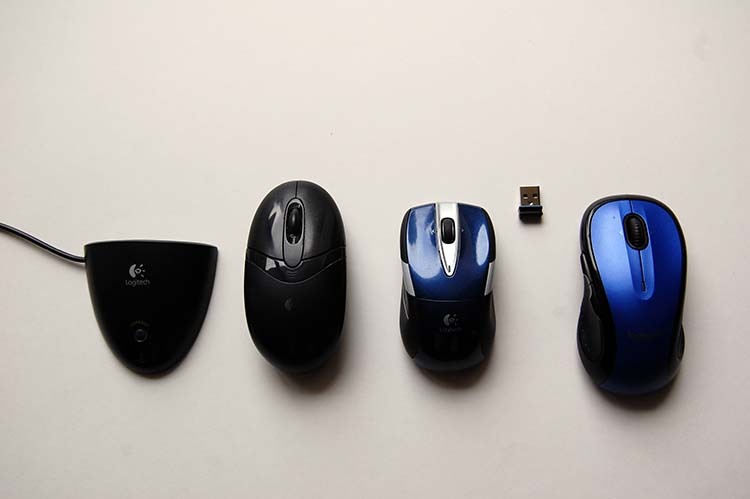 For more information on the Logitech mouse products, please check out Logitech computer mice. After purchasing my headset and 2 mice, I realize that I'm very brand loyal to Logitech accessory products. This happened over a few years of using their products and being happy with the performance and how long they lasted. I've never had any issues, so I can't report on their level of support. If you are looking to purchase a new headset or mouse, I recommend you checkout the Logitech brand and see if it is right for you. Now I'm looking to purchase a new keyboard. I should have purchased it when I purchased my wireless mouse. A lot of companies will package the mouse and keyboard at a discounted price. Most keyboards are wireless these days, but I still like a wired keyboard. I don't move my keyboard around a lot and I don't want the hassles of replacing batteries.